Brand new cycle destination signs, reminding of metro-line information signs, were placed alongside a test route in Tilburg. That city and the province of North Brabant are testing this new type of signposting (and another type) for the future fast cycle routes in the entire province, possibly in the rest of the Netherlands too. A test panel was asked to give their opinion, but the public was also allowed to answer an online questionnaire. The Living Lab included tests with new centre lines, such as this one. All in an effort to make the main cycle routes more recognisable as a fast cycle route. 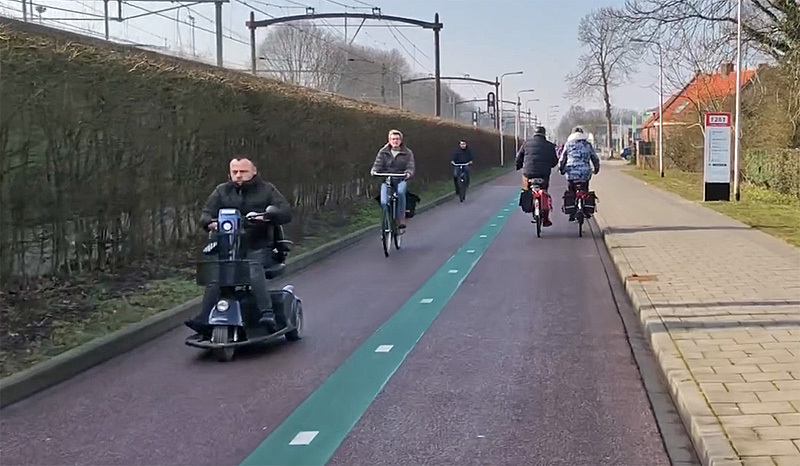 In the foreground a reminder that people in mobility scooters also use the fast cycle routes in the Netherlands. This type of signposting looks quite different from what the Dutch have been used to for about a century now. In 1919 a now common type of “mushroom”-shaped wayfinding sign was first placed in Baarn by a cycleway society. Anther type is the tall sign that developed from the ones the tourist board ANWB first designed. White signs with red lettering on a blue and white post.